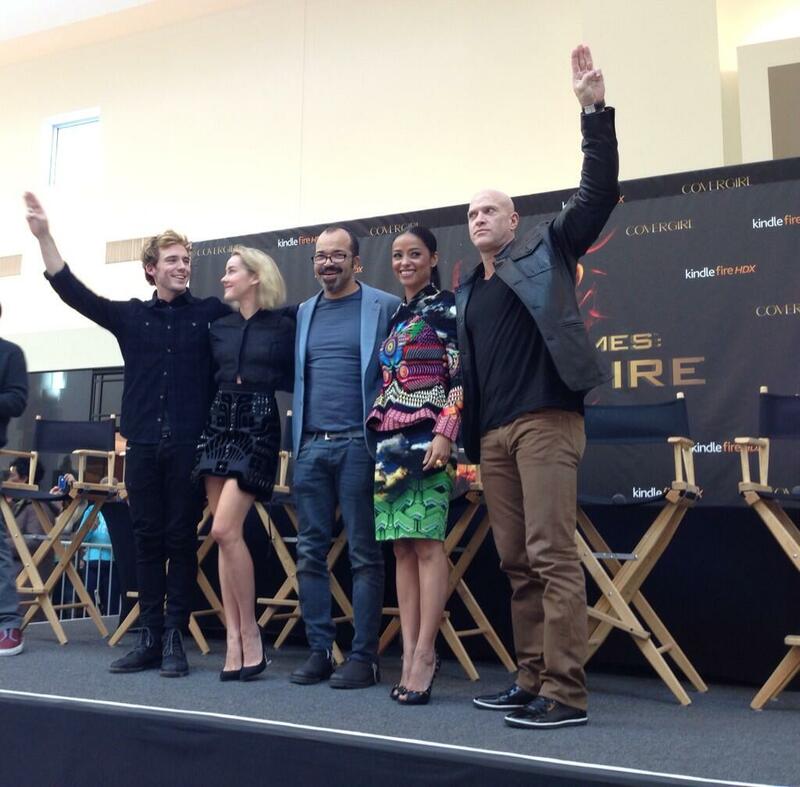 Sam Claflin, Jena Malone, Jeffrey Wright, Meta Golding and Bruno Gunn were at the Cherry Hill Mall in Philadelphia today for the first stop on the Catching Fire promotional "Victory Tour". Sam Claflin talked about his transformation into Finnick, particularly the "six pack, tan, and waxed chest". He also spoke about how much he enjoyed the experience of working with the amazing cast, and mentioned that the fans are like his family. Jena Malone loved being able to beat the boys in the gym and spent a lot of time chopping with an axe. She even called herself the biggest fan from the cast before filming, as she read all 3 books in 48 hours. Apparently, the fans are like a revolution to her! Jeffrey Wright said how much he likes being part of the solution to a corrupt government, and it's something he feels people can relate to. If he could choose another character (besides Beetee) to be from the Hunger Games trilogy, then it would be Peeta! Jeffrey said this was because of the character's journey (and also because Josh is so cute!) He mentioned the relaxed nature of the set, and that the movie ROCKS! Meta Golding likes her sharpened teeth, and called Enobaria a "badass" rather than a "baddie". She also told how she threw up on the second day of training for the role, and was worried about whether she could complete it or not. Her favourite character is Katniss, and she loves the concept of surviving in the Hunger Games. Bruno Gunn's favourite bit of being a part of the series is meeting all of the fans. He admires the respect and passion everyone has for The Hunger Games. Many thanks to @otherjlaw for recording the whole thing. Your efforts are greatly appreciated, and allows those who weren't there to watch and enjoy!